Details of front arches of the Chota Sona Masjid or Small Golden Mosque, Gaur. bl.uk > Online Gallery Home	> Online exhibitions	> Asia, Pacific and Africa Collections	> Details of front arches of the Chota Sona Masjid or Small Golden Mosque, Gaur. 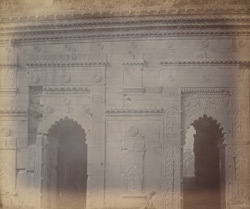 This is one of a series of photographs taken by Joseph Beglar for the Archaeological Survey of India in the 1870s. It shows part of the facade of the Chota Sona Mosque, or Lesser Golden Mosque, also known as the Gem of Gaur built during the reign of Alauddin Husain Shah (1493-1519). The mosque was built by a nobleman, Wali Muhammad, entitled Majlis al-Majlis Majlisi Mansur. Its name refers to the fact that its domes were once gilded. The plan of the mosque comprises five bays, with corresponding entrances and recessional niches, and three aisles. The central bay is roofed with local 'char chala' vaulting whilst the remainder are domed. There are five entrance arches on the façade of the mosque; each one is surrounded by carved black basalt panels decorated with inscriptions, rosettes and vegetal motifs.